Description: Backsmocking creates an interesting rippled effect in the neckline smocking of the little bishop. Scalloped wheat stitch outlines the lower egde of the design. 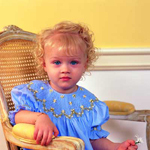 The sleeves are also smocked with wheat stitch medallions and embroidered bullion daisies.